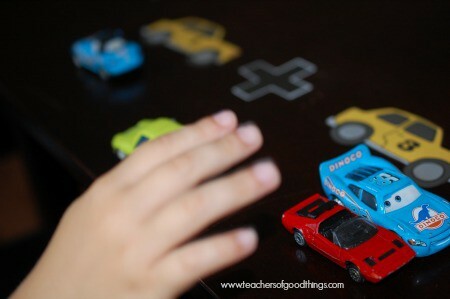 My little guy loves cars and I love hands-on learning, especially for math. 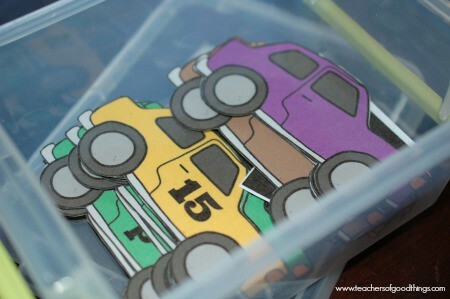 I created this fun learning box that combines his love of cars with my need to teach addition. He absolutely enjoys to learn how to add! 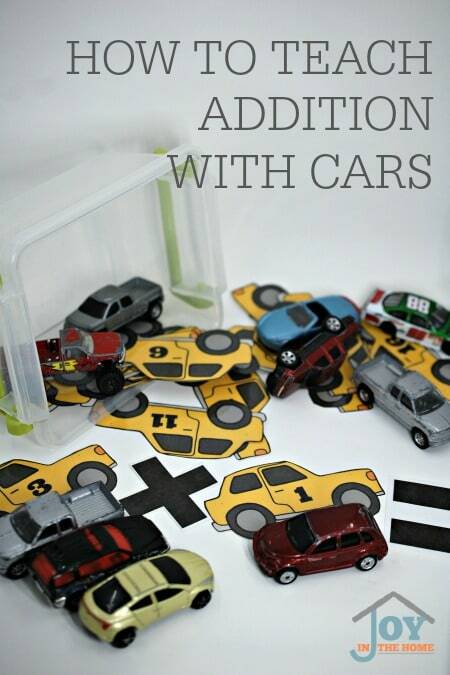 Once a child knows how to count, the next step would be to reach addition, so why not do it with cars! 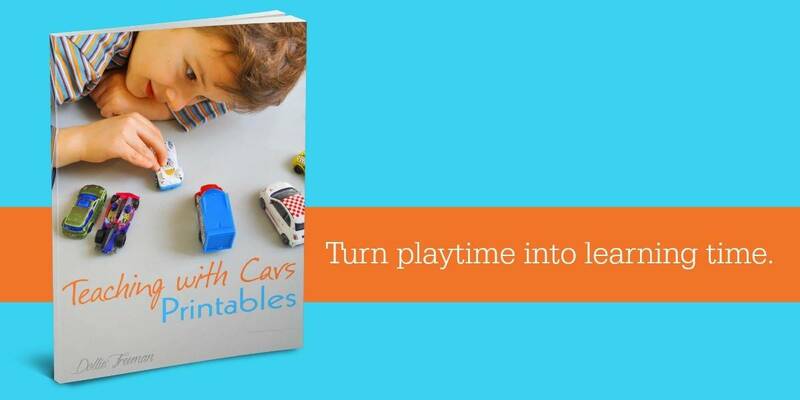 To do this learning box, you will need to get my Teaching with Cars ebook. My son LOVED it when he saw that I put this together for him. 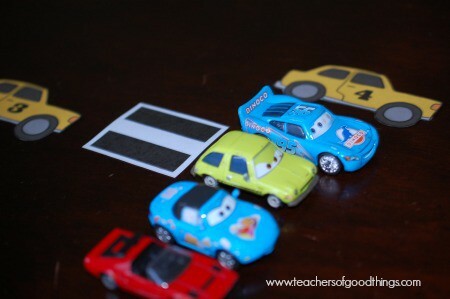 He just couldn't wait to get his hands on the printable cars and I couldn't wait to turn play time into learning time. I laminated my pages and then cut out the cars so they will last longer. I pile the yellow number cars on the table and ask him to pick two numbers, which he tells me what they are as he takes them. I place the ‘addition‘ sign between the two cars and then added the ‘equal‘ sign after the second car and told him we build an equation. I told him the equation says ‘one plus three equals' and have him repeat it for me. Then I tell him to build it with his cars. He needs to ‘drive‘ one car over the the one and three cars over for the three. He smiled from ear to ear, as he grabbed his car bin and started driving the correct number of cars to their rightful place under the equation. Once he had all of his cars under the equation, I had to count to be sure he had the right number of cars. When he knew that he did, I told him that he now needs to drive the cars after the ‘equal sign' so we can find the answer to the equation ‘one plus three equals'. He was only too happy to drive the cars to their new location. Once they were all there, I had him count the cars out loud. 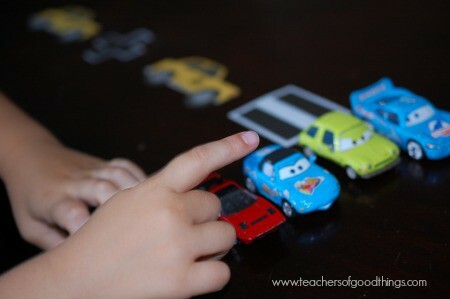 Once he knew how many cars at ‘one plus three‘ equals, I asked him to find that number on the cars on the table. He quickly found the ‘number 4 car' and I told him to place it over the cars. We repeated the equation ‘one plus three equals four‘. He then started over with a new equation, but I made sure we only worked on 2-3 equations to stay true to the short lessons that I love with the Charlotte Mason method. We store the laminated cars in a small bin that fits nicely in our learning center desk. 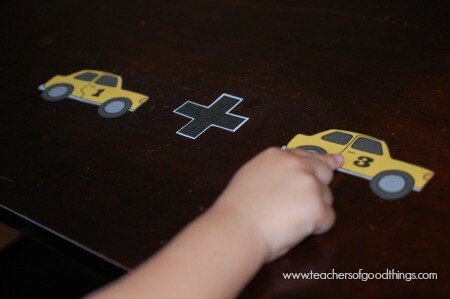 Did you see the learning box activity for teaching colors with cars and even spelling with cars?